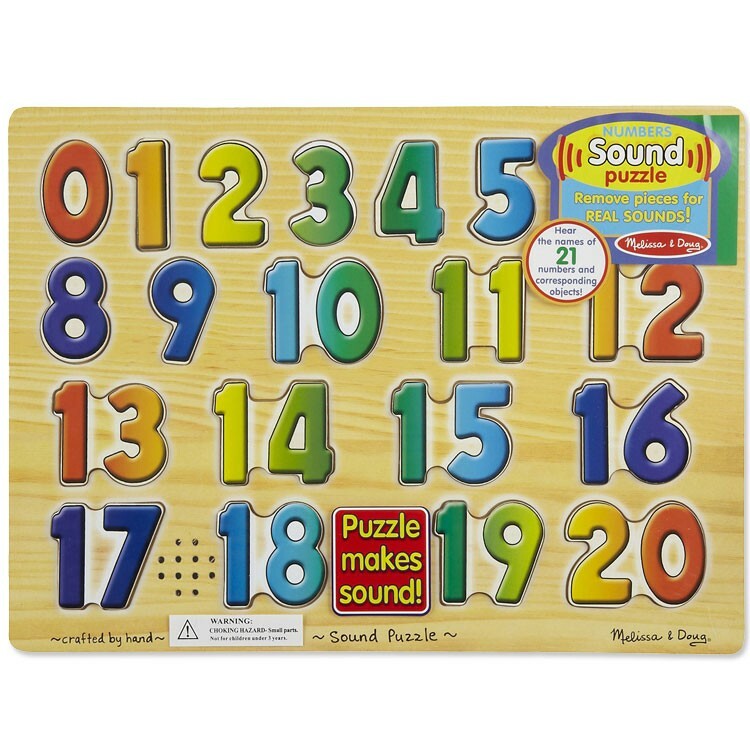 When each of 0-20 number pieces is in its correct place, the board of this Melissa & Doug's sound puzzle will announce the number of that puzzle piece! 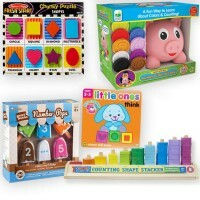 Numbers, puzzles, and even sounds! 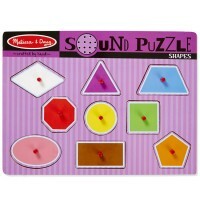 Melissa & Doug, an award winning toy company, offers high quality sound puzzle that brings numbers to life for your toddler. 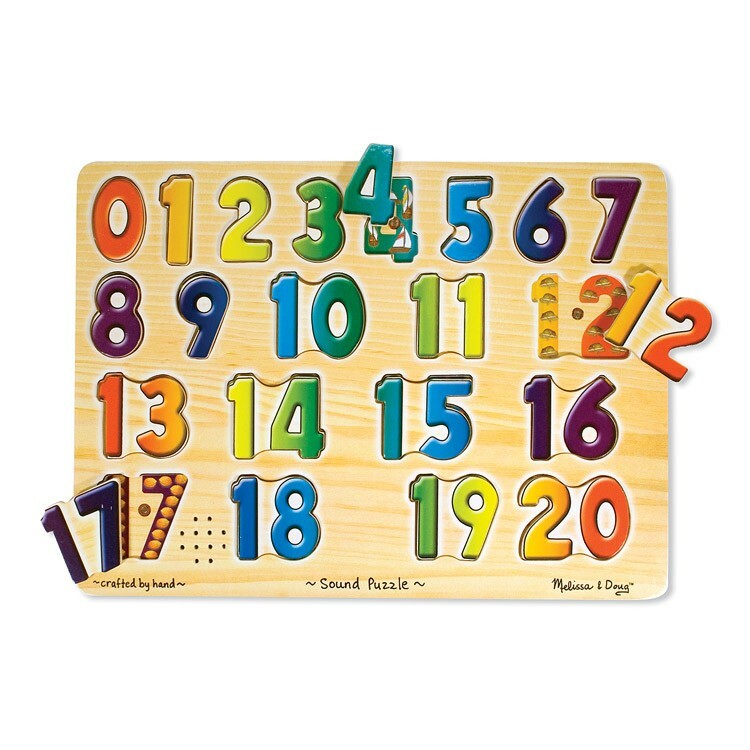 The Numbers Sound Puzzle Learning Toy, offered by Educational Toys Planet, is a wonderful way to reinforce cause and effect, number identification, and problem solving skills. 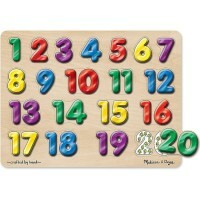 Your child will love placing each wooden colorful number shaped puzzle piece on the sturdy board. 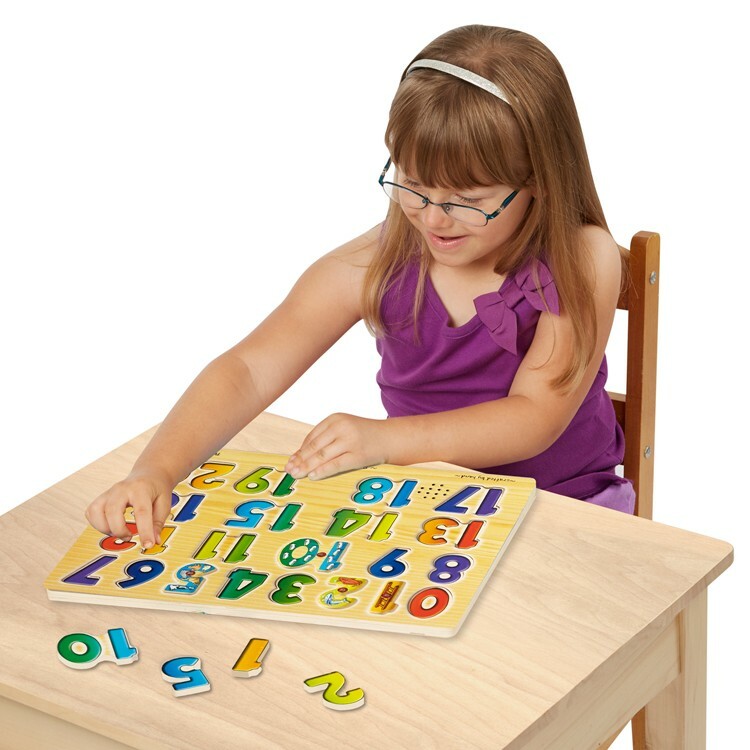 When the easy-to-hold piece is in its correct place, the board of the Numbers Sound Puzzle Learning Toy will announce the number of that puzzle piece! This electronic math toy will entertain your young children as it helps them practice fine motor skills and matching skills. 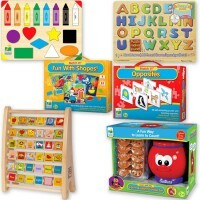 The top learning puzzle is a great educational toy for the preschool, library, waiting room, or your play room. Dimensions of package 10" x 1" x 13"
Write your own review of Numbers Sound Puzzle Learning Toy. Rating: 5 Love! by Jessica G This is a great puzzle. 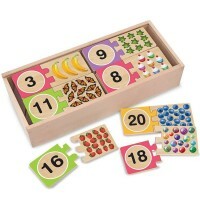 It is perfect for small kids learning their numbers and practicing counting. 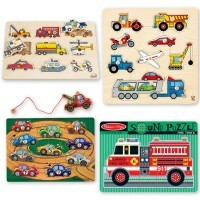 Melissa and Doug always makes high quality and beautiful toys and this is no exception. It will be any preschooler's favorite new toy. 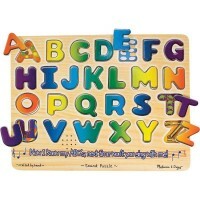 However, it would be nice to have knobs on the pieces so that it is not quite so difficult to maneuver for small hands. With that said, it is colorful and fun and will attract and hold any small child's attention and that's a feat. 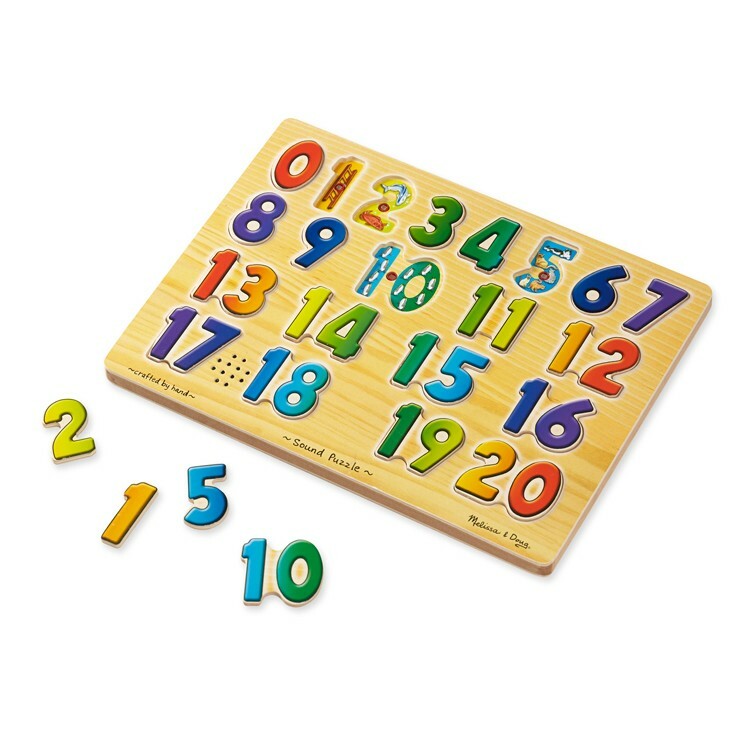 Rating: 5 by Catalina, TX it is a very good educational toy to introduce numbers with fun. my grandaughter is very curious and eventually she will learn the numbers. 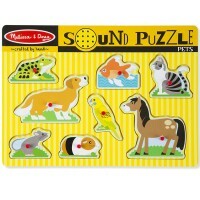 Rating: 5 by Carole, MI This puzzle was a big hit with a two-year old. 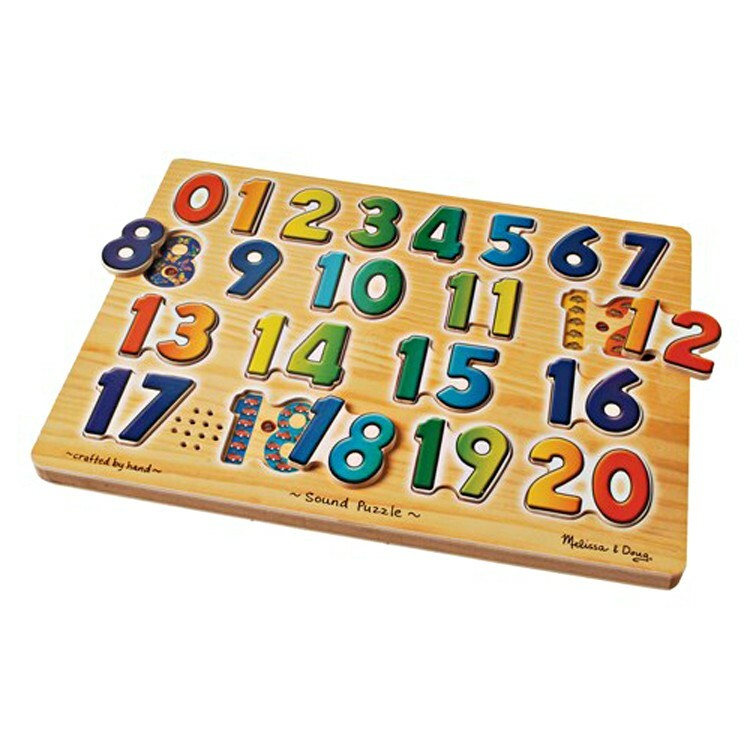 Excellent way to teach numbers and practice eye-hand coordination. 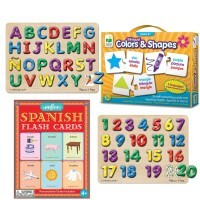 Rating: 3 by Hannah, NY I like that it is educational and catches my 18 month old son's attention. Two dislikes: the numbers do not have knobs and the pictures are not clear. 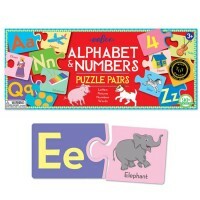 Rating: 5 by Barbara G., NJ Our library purchased this number puzzle for the children play room. The order arrived in a few days. All the toys are good quality products. Thank you.